Live broadcast with Sonnambula on March 12, 2019. WRTI’s Susan Lewis, host. Praised as “remarkable” and “superb” by The New Yorker, the early-music ensemble Sonnambula—a viol consort based in NYC—visited the WRTI 90.1 Performance Studio and played highlights from upcoming concerts with Piffaro, The Renaissance Band and works from a new album of music by 17th-century composer Leonora Duarte. WRTI’s Susan Lewis is host. Sonnambula is a historically informed ensemble that brings to light unknown music for various combinations of early instruments with the lush sound of viol at the core. They’ll be in Philadelphia for performances with Piffaro, The Renaissance Band: Dancers’ Delight: Michael Praetorius’ Terpsichore, featuring 16th- and 17th-century music of dance on Friday, March 15th, 7:30 PM at Philadelphia Episcopal Cathedral, Saturday, March 16th at 7:30 PM at Presbyterian Church of Chestnut Hill, and Sunday, March 17th at 3 PM at Christ Church Christiana Hundred, Wilmington. 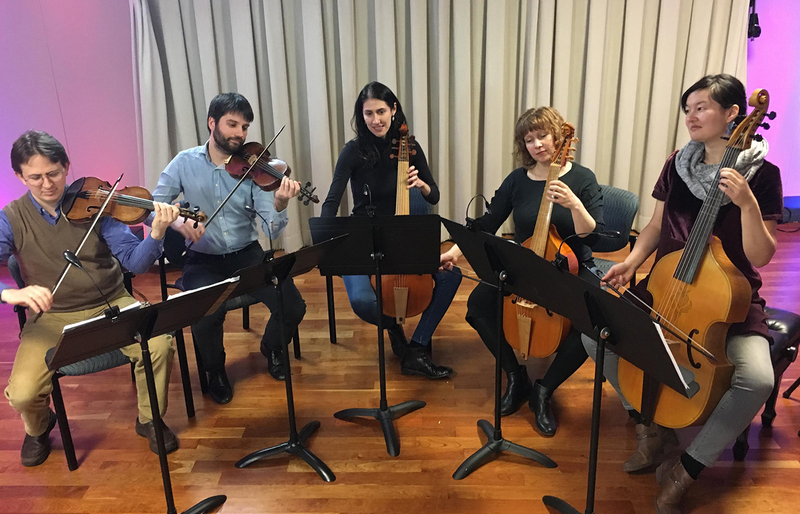 Sonnambula is currently Ensemble-in-Residence at The Metropolitan Museum of Art, where they have designed a site-specific series at The Cloisters Museum. The group is the first historically informed ensemble to hold this position, typically given to a string quartet. The ensemble had its début at The Metropolitan Museum of Art’s MetLiveArts series in the 2016-2017 season with a landmark performance of the complete works of Leonora Duarte (1610-1678), which is also the subject of the ensemble’s first album to be released on June 7, 2019 with Centaur Records, Inc. This is the first complete recording of Duarte’s work. Sonnambula has a strong commitment to education, and has presented interactive masterclasses, lecture/demonstrations, museum programs, and composer workshops at The Frick Collection, The Hispanic Society of America, and Princeton University, where they worked with student and faculty composers in the Princeton Sound Kitchen lab to commission new work for old instruments, an effort that culminated in a concert of new music at Princeton in April 2017 and a workshop the year before.